When school begins routines and schedules change and chores for kids seem last on the list of things to do. Yet you want to include chores in these routines so they are followed throughout the year without a fuss. A great way to make them work is to make them a parent-child/teen effort. When school begins routines and schedules change and chores for kids seem last on the list of things to do. Yet you want to include chores in these routines so they are followed throughout the year without a fuss. A great way to make them work is to make them a parent-child/teen effort. Working together takes the sting out of the process. In time the kids will do them on their own, but it's a good way to transition to a way for chores to be incorporated into the household without reminders, feelings of parents' not being listened to and kids feeling they have an undue burden given all the new school requirements. 1. Have everyone clear the table after dinner. Then it's not one person's job but the role of the family together. It takes less time and no one feels they've been pulled in to a job they didn't plan on. 2. Fill the dishwasher with your child. Then it goes quicker, he or she learns how to order the dishes on the rack and before you know it the job is done with no complaints. 3. Work with your child to clean and organize their room for school. They'll learn from you how to plan things out so they can be found again without them feeling you are intruding or pressuring them to keep things just your way. Listen to how they like to organize their books and papers and help them straighten out those clothes drawers. Doing it together takes away the feeling of parents yelling at kids to clean their rooms. In time they will want to do it on their own and it's important for you to be flexible. This is the one room in the house that should be considered theirs. It increases independence and makes getting homework done much easier. 4. Teens can be taught how to use the washer and dryer so for last minute needs they can help out or even run their wash themselves. It's great preparation for college, it shows you trust them once they've learned, and it's really easy after all! 5. If you're a two parent household, divide up which parent will take the lead on different chores so no one argues about responsibilities. The kids will learn who's in charge of what and things will be move at an even pace. 6. Jobs outside may be the province of one or both parents. Kids like to understand how the house works. Explain how the electricity comes from the street and how the house is heated. Show them how to change a light bulb, replace batteries and work with you to take out the garbage including the items to be recycled and they will begin to learn how a household works. It improves confidence when kids feel they are really a part of running the house. They begin to feel less like they live in your house and instead everyone belongs because everyone knows how things work. 7. To make this new venture successful, a brief meeting needs to take place where the new arrangements are discussed and you express that you are grateful to them for helping out. Tell them you've made this plan so beginning of school starts easily and that you trust them to work with you to make a smoothly running household. Be open to their ideas about how things should work in the house. Value their opinions, ideas, and intentions. Respected children and teens respect their parents. 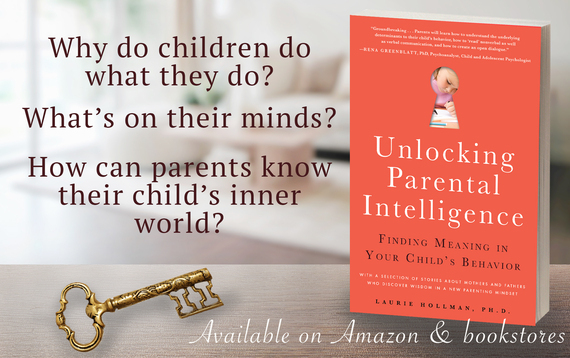 Laurie Hollman, Ph.D., is a psychoanalyst and author of Unlocking Parental Intelligence: Finding Meaning in Your Child's Behavior found on Amazon, Barnes & Noble, Familius and wherever books are sold.